PIGEON FORGE, Tenn.—East Tennessee native and longtime Nashville resident Dolly Parton announced plans today for Dolly Helps Nashville, a fund raising weekend set for May 22 and 23, 2010 with net admission proceeds from her Dollywood and Dixie Stampede properties in Pigeon Forge, Tenn. earmarked for Music City flood relief efforts. Parton will make several special appearances at various theaters and locations throughout Dollywood and at Dixie Stampede to greet guests who visit for the weekend event. “I grew up in the Smokies in East Tennessee, which was my first home. I moved to Nashville 46 years ago and that is my home now,” Parton said. “I have family and friends in both places, and when one place hurts; I think it is just right for the other to help. Davidson and three surrounding counties were declared federal disaster areas after record-breaking rainfall on May 1 and 2 devastated the area and destroyed homes and businesses. With strong roots in the Nashville community, Parton felt the impact of the natural disaster and organized Dolly Helps Nashville to aid those displaced by the flood. Parton also issued a plea to her fans to help the fund raising effort reach its full potential. For more information on the flood relief effort, please visit www.dollyparton.com. 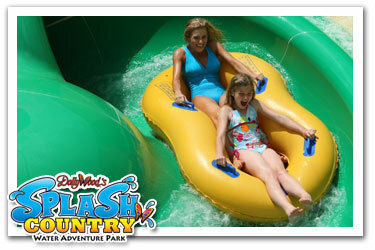 One of the sure signs of summer is the opening of Dollywood’s Splash Country. The 2010 season begins Saturday, May 22. Come see why Dollywood’s Splash Country was named “America’s Must-See Waterpark.” Remember, every Saturday season passholders and their guests (with valid admission) are admitted one-hour early to enjoy a select attraction that is open just for our season passholder family, beginning with the new Slick Rock Racer on May 22! Plus, surprise giveaways are planned on random days throughout the season for season passholders. You qualify simply by scanning your season pass at the turnstiles.